Australian designer Mark Gowing explains that the repeating forms of his country’s minimalist landscape are manifested in his geometric compositions. This poster was designed to advertise a solo exhibition of the work of Jonathan Jones, a Sydney-based Aboriginal artist from the Kamilaroi/Wiradjuri nations located in South Eastern Australia. Jones’s work in sculpture and installation features fluorescent tubes and incandescent bulbs, often arranged in patterns that have their origins in the Kamilaroi/Wiradjuri traditions. His exhibition at Sherman Contemporary Art Foundation, untitled (the tyranny of distance), showcased a piece with fluorescent lights enclosed in a blue tarpaulin. For the poster, Gowing adopted the colors, light, and shade of Jones’s artwork and created a typeface that echoes the angular lines of the fluorescent tubes. Poster, Jonathan Jones: untitled (the tyranny of distance), 2008. 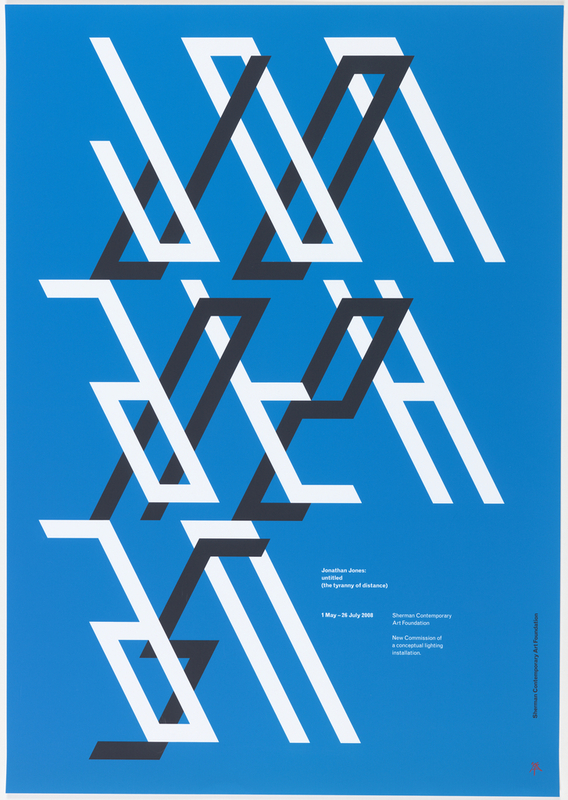 Designed by Mark Gowing (Australian, b. 1970) for Sherman Contemporary Art Foundation. (Paddington, Australia). Screenprint. 84 × 51.6 cm (33 1/16 × 20 5/16 in.). Gift of Mark Gowing, 2014-32-2.